An integration of family systems perspectives with developmental psychopathology provides a framework for examining the complex interplay between family processes and developmental trajectories of child psychopathology over time. In a community sample of 98 families, we investigated the evolution of family relationships, across multiple subsystems of the family (i.e., interparental, mother-child, father-child), and the impact of these changing family dynamics on developmental trajectories of child internalizing symptoms over 6 years, from preschool age to pre-adolescence. Parent–child relationship quality was observed during lengthy sessions, consisting of multiple naturalistic, carefully scripted contexts. Each parent completed reports about interparental relationship satisfaction and child internalizing symptoms. 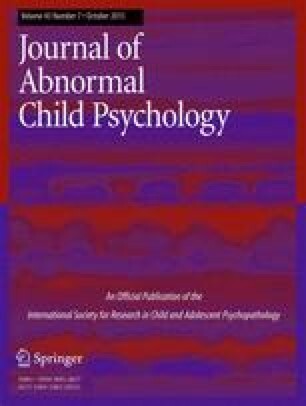 To the extent that mothers experienced a steeper decline in interparental relationship satisfaction over time, children developed internalizing symptoms at a faster rate. Further, symptoms escalated at a faster rate to the extent that negative mother-child relationship quality increased (more negative affect expressed by both mother and child, greater maternal power assertion) and positive mother-child relationship quality decreased (less positive affect expressed by both mother and child, less warmth and positive reciprocity). Time-lagged growth curve analyses established temporal precedence such that decline in family relationships preceded escalation in child internalizing symptoms. Results suggest that family dysfunction, across multiple subsystems, represents a driving force in the progression of child internalizing symptoms. The online version of this article (doi: 10.1007/s10802-015-0008-9) contains supplementary material, which is available to authorized users. This research was funded by grants from NICHD (R01 HD069171), NIMH (R01 MH63096 and K02 MH01446), and a Stuit Professorship (to G.K.). We thank Lea Boldt, Sanghag Kim, Jarilyn Akabogu, and Jeung Eun Yoon for their contributions to data collection, coding, and file management; and the participants in the Family Study for their commitment to this research.